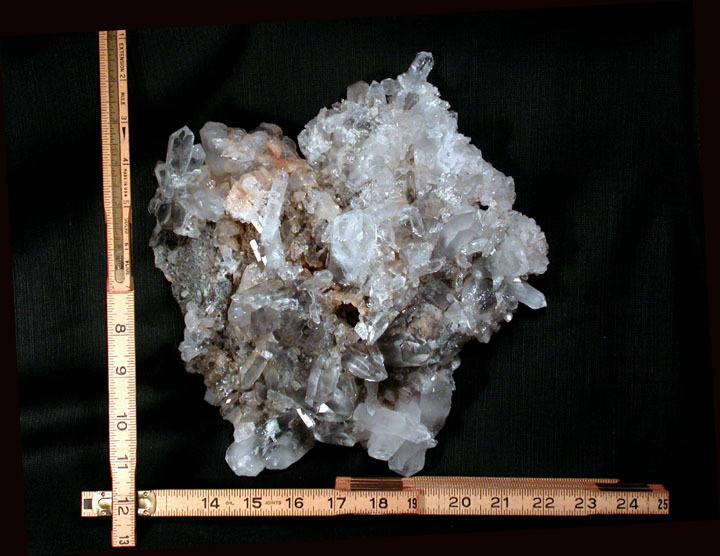 This is the star-shaped rock crystal cluster featured on the back cover of our book, "The Buyer's Guide". 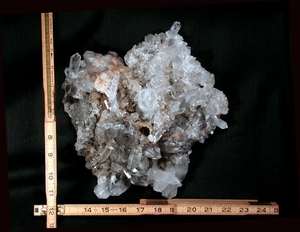 Chosen as one of the best in show specimens of Arkansas rare blue phantom quartz, its' members include a 1x 3-1/2" penetrated phantom point, a stout uncommon chisel with a cadet blue phantom of 1-1/2x 2-1/2", doubly-terminated crystals, open shale matrix, and clear to heavily veiled crystals. 10-1/2"x 12"x 4" tall, its' plate bottom allows it to self-display flat, or on a sturdy easel. Scattered small rainbows and whorls of smaller clusters abound. We have left some of the natural iron oxide staining which we consider an enhancement to this cluster - if you'd like this specimen re-cleaned, please let us know in the 'message to seller' space of the shopping cart, and realize there will be a delay in shipping due to this. Sent gift boxed with a complementary copy of our book and a hand written description. Shipping will be added.